Cold Light on Spiritualistic "Phenomena" - An Experiment with the Crewe Circle by Harry Price, F.R.N.S. "When I consider life, 'tis all a cheat, Yet, fooled with Hope, men favour the deceit...." Dryden, Aureng-zebe, Act IV. Sc.1. Owing to the fact that the Journal of the Society for Psychical Research is printed only for circulation among its Members and Associates, I have decided to reprint the result of my experiment with the Crewe Circle, thus giving the public a useful lesson in the observation of alleged psychic photography. I should like to make clear that this case is an exposure of so-called "spirit" photography; the various other phases of supernormal phenomena must be judged solely on their merits. I desire to tender my thanks to the Imperial Dry Plate Co., Ltd., Cricklewood, N.W., for their kindness in preparing the plates used in the experiment. Cold Light on Spiritualistic "Phenomena." In the last number of the Journal it will be remembered that a discussion upon faking spirit photographs was initiated by Col. Baddeley and Major Spencer, arising out of an experiment conducted by Mr. William Marriott. The controversy revolved around the alleged mediumship of Mr. William Hope of Crewe, and in speaking of him Col. Baddeley remarked that "he has never been 'caught out,' in spite of innumerable tests with persons who were good amateur conjurers and expert photographers." It may not be known to members generally, that the officers of the Society have for some considerable time been endeavouring to persuade Mr. Hope to allow his mediumship to be tested by a competent committee. The present Research Officer has done his utmost since his appointment to persuade Mr. Hope and his advisers to allow him to have some sittings under almost any conditions, but without avail. Fortunately, however, we have been able to avail ourselves of certain investigations by persons whose qualifications were partly unknown to the medium and his advisers. We print below a report from one of these investigators, dealing with the medium Hope; the writer of this report, Mr. Harry Price, is a Member of the Society, and combines a wide experience of photographic processes with an extensive acquaintance with deceptive methods and contrivances. At one time he was Hon. Librarian of the Magicians' Club, London, and is also a member of the Society of American Magicians. 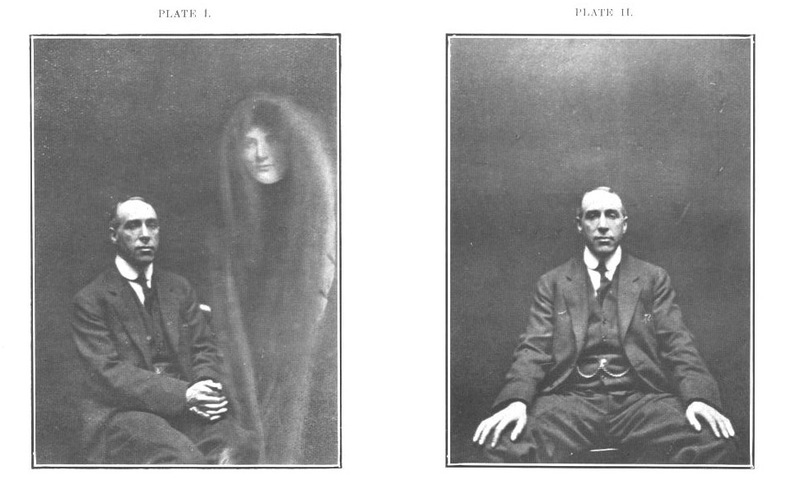 The Society possesses two "spirit" photographs taken by Mr. Price twenty-two years ago, which indicate that the writer possesses some qualifications for the experiment described below. sitting but received no reply. On March 10, 1921, he applied again but met with a similar result. On November 11, 1921, he called at the British College of Psychic Science, with a letter of introduction from the Librarian of the London Spiritualist Alliance (of which organisation he is a member), and saw the Hon. Secretary, Mrs. B. M'Kenzie, who promised to try to arrange a sitting. DEAR MR. PRICE, - I enclose particulars of an experiment offered you with the "Crewe Circle." If you decide to take this, kindly confirm as soon as possible. The fee for non-members is £2 2s. 0d., to be paid on confirmation. You should provide a half-dozen packet of 1/4 plates for the experiment, Imperial, or Wellington Wards are considered preferable. Mr. Hope gives every opportunity to the sitter during the experiment, but he will not undertake tests and will use his own camera. Nothing is guaranteed but good results can be assisted by sitters keeping the plates in their environment for a few days. If you wish you are at liberty to bring a friend to share the sitting if they a sympathetic, for the one fee. Friday, Jan. 27th, 10.30 a.m.
On January 21, 1922, a letter was received from the College, saying that owing to illness the Crewe Circle would have to transfer the appointment to February 3, which date was again cancelled in favour of February 24, at 10.30 a.m.
tests by which we can invisibly mark the plates which will be handed to Hope. We have decided as the best method that the plates shall be exposed to the X-rays, with a leaden figure of a lion rampant (the trade mark of the Imperial Co.) intervening. The centres of each set of four plates will be treated, so that when the plates are placed in their proper order, the full design will be seen. This is to safeguard against the allegation that some of the plates may have been missed in the marking. Any plate developed will reveal a quarter of the design, besides any photograph or "extra" that may be on the plate. This will show us absolutely whether the plates have been substituted. I am also thinking out other safeguards that may help us. We are sending to-day under separate cover the box of our Flashlight plates, quarter-plate size, bearing batch No. 14400 G. These 6 plates have been specially dealt with by us, and have been put through an exposure for a small portion of each under our X-ray apparatus, so that when the plates are developed parts of the design of our rampant lion trade mark will appear upon each of them. Four of the plates when put together will complete the whole design, whilst the other two will only form a portion of the design, whilst we have the remaining two to complete the figure in our possession, which we are retaining until you communicate with us again. We have tested this method and find it to be quite infallible, and it is impossible for anyone to have adopted the same steps which we have with regard to these 6 plates, and therefore it would be quite impossible for anyone to have effected any exchange of plates for the method you have under consideration. In due course the plates arrived, and Mr. Price immediately handed them in their original postal packings to Mr. H.J. Moger of Pulborough, Sussex, who, in turn, sealed them privately and forwarded them to the Secretary of the Society for Psychical Research, for safe keeping. In this condition they were kept until handed to Hope in the séance room at the British College of Psychic Science. Another point which occupied Mr. Price's attention was the choice of a suitable companion to assist him during the sitting. Acting on the advice of the Research Officer, he asked Mr. James Seymour to accompany him; this gentleman, by a happy concatenation of circumstances, combining precisely that knowledge of photography and trickery so essential for an experiment of this kind. On the morning fixed for the sitting the Research Officer met Mr. Price and his companion at Holland Park Station, and handed over the sealed packet of plates for use in the experiment. After it was over, both investigators immediately proceeded to the Rooms of the S.P.R., where a report of the sitting was dictated to a stenographer, in the presence of both the Secretary and the Research Officer. The following is a connected narrative of what occurred during the time that Mr. Price and Mr. Seymour were at the College for the experiment. It is derived entirely from the verbatim dictated report taken down within forty-five minutes from the conclusion of the sitting. during the whole of the conversation and were in the original Imperial postal wrappers as sent to me at Pulborough. Mr. Hope then asked us to sit round the table. We sat at a small table, Mrs. Buxton facing me, Mr. Seymour on my right, and Mr. Hope on my left. I noticed Mrs. Buxton eyeing the packet with the outer wrappers very considerably, because apparently she was not used to having plates brought like that. Mr. Hope then asked me to undo the postal packet, which I did, and I cut the string in two places, and threw the postal wrappers on the floor, placing the unopened packet of plates on the table. Mr. Hope then picked up the packet of plates and started examining them. Then Mrs. Buxton said, "They are flash-light." I said, "I told the Imperial people that they were for portraiture inside a London room, and they suggested flash-light." Then Mr. Hope examined the packet and then he handed it to Mrs. Buxton, who again examined the packet very minutely - I could see her eyeing the packet. In my opinion, at that juncture they came to the conclusion that the packet had not been tampered with, because at that moment Mrs. Buxton asked me whether the packet had been opened. I said, "It is exactly as I got it from the makers, outer wrapper and all" - I was careful to say that. Mrs. Buxton then examined it to find the speed number, as Mr. Hope apparently could not see it. Suddenly Mrs. Buxton said, "Here is the speed number, it is 400 on the packet," and Mr. Hope said, "Oh, yes, that will be all right." Mr. Hope then pushed the plates into the middle of the table, and said, "We will have a hymn," and asked me whether I had any particular choice of hymns. I said, "I know all the old ones - I should like 'Onward Christian Soldiers.'" Mr. Hope looked at Mrs. Buxton and said, "Could you manage 'Onward Christian Soldiers'?" She hesitated, and so, as I saw the hesitation, I said, "Any familiar hymn will do." So Mr. Hope then said, "How about 'Nearer my God to Thee'?" - we were simply linked up. Mr. Hope and Mrs. Buxton's hands were not linked during the whole of the time. Mrs. Buxton then sang several verses - six or seven - of "Nearer my God to Thee," in a tune with which I was unfamiliar, and did not recognise. I did, however, join in where and how I could. After the hymn Mr. Hope gave a long impromptu prayer, in which he thanked God for all our many mercies, and hoped He would continue His blessings up to the present moment. He also craved blessings on our fellow-creatures and friends on the other side, and asked assistance in the attempt to link up with them, etc. etc. Then Mrs. Buxton sang another hymn, and then Mr. Hope picked up the packet of plates from the centre of the table and put them between Mrs. Buxton's hands; then he put his hands on hers, I put my hands on his, and Mr. Seymour came last of all, making a pile of hands with the packet of plates in the centre. Then we had another short impromptu prayer by Mrs. Buxton. Then the Lord's Prayer was sung, and a short hymn concluded the service. Mr. Hope now asked me whether I would like to sit by myself, or whether I would like Mr. Seymour to sit with me. Of course I said I would like to sit by myself, and Mr. Seymour made the remark that as it was my sitting he would prefer that I should sit by myself. down at the table with Mrs. Buxton, and keep his hands on it all the time, so as to "maintain the influence." After the sitting was over, he said to Mr. Seymour, "You could have come in the dark-room, if you had liked." At the entrance to the door he asked me whether I would open the packet of plates. While I was feeling for my knife, he pulled out a knife and opened the packet himself. He then made a remark to Mrs. Buxton to look after Mr. Seymour, while we were in the dark-room, after which he closed the dark-room door. He then handed me the dark-slide again, and also handed me the opened packet of plates. He then said, "I will not touch the plates, as I don't want you to think there is any trickery. Do exactly as I tell you, I will not put a finger on the plates." He then said, "Now which two will you have, some take one and two, some one and three, some three and four. Will you take the 1st and 3rd?" I said, "I will take the 1st and 2nd." He said, "All right, it does not matter, some have one and some have the other." "talking" or knocking. He said, "Have you finished?" I said, "Yes." He then said, "Will you put the packet of plates into your pocket so as I cannot touch them." I said, "Yes." We got to the door; he was just going to open it, when he said: "Would you like to mark the plates and write your initials on them?" I said, "I don't think it matters; would you advise it?" and he said, "Oh, well, some do it; some do not." I said, "I don't think I will in this case," and he said, "All right, if you are satisfied, I am." He then handed me back the dark-slide, after I said I would not write my initials on the plates, and we walked into the studio. shutter and exposed another plate, and gave as long an exposure as before - I counted up to "18 and." While the exposures were going on, Mrs. Buxton and Mr. Hope buried their heads in the sides of the focussing cloth, as though in prayer, and kept contact with the camera. They then closed the dark slide up and took it out of the camera, and immediately handed it to me again. I then put it in my pocket. Mr. Hope turned to Mr. Seymour and said, "You understand photography?" Mr. Seymour said, "Yes." Then he turned to me and said, "You can develop it if you like (referring to both of us), and I said, "I will develop it." We three went into the dark-room with the slide in my pocket. Mr. Hope then started mixing some developer into a glass measure; brought me a rather dirty (stained with silver stains at the bottom) porcelain dish which just held the two quarter-plates, which were developed together. Mr. Hope took the dark-slide out of my hand and opened it. He then said, "Hold out your hands and I will tip the plates on to your hands so that I do not touch them." He did so. I then put the plates in the porcelain dish myself, and Mr. Hope poured the developer over them, and to my surprise, instead of the plates flashing up black at once, as it seemed they ought to have done had they been those I brought with me, the plates developed slowly (as ordinary slow plates would do). a £1 note, and she went into the office and brought me back the change. We left the college at 11.20 a.m. The same afternoon, Mr. Price, Mr. Seymour and Mr. Dingwall went to the studio of Reginald Haines, in Southampton Row, where the remainder of the plates were developed at 3.5 p.m., by an operator of Mr. Haines' under supervision. On each of the four plates the section of the Imperial Co.'s trade mark came up clearly, thus showing what part of the design Hope had retained. The figures will, we hope, make the matter clear. Fig. 1 illustrates the design of the leaden stencil used in marking by the X-rays. Fig. 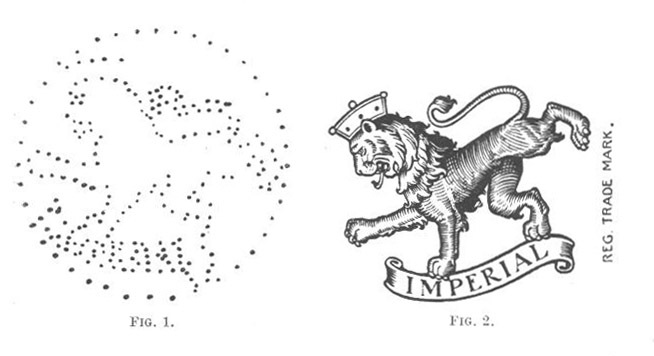 2 is the Imperial Co.'s trade mark placed beside the stencil design for comparison. Figs. 3 and 4 show the design with those portions blank, which were on the plates retained by Hope, of which one has since come into the hands of the Society. 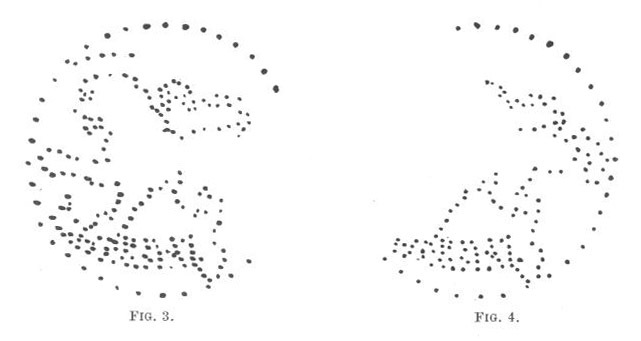 Plate I. is the result containing the extra, which should bear that part of the stencil design shown missing in Fig. 4.
of slightly different colour. It is one of the two plates substituted by Hope (as described above). Of the two original plates retained by Hope one, as we have said, is now in our possession, thus making only one blank in the complete set of eight plates, including the two kept by the Imperial Dry Plate Co., Ltd. (see their letter above), which they returned for the purpose of discovering what portion of the design had been retained by the medium. detected as easily as substitution, were competent witnesses, with adequate photographic and magical knowledge, permitted to test the "phenomena" produced by Mr. Hope. Meanwhile - desiring in this matter to be scrupulously just - we are willing to publish in a later number of the Journal an account of a sitting with Mr. Hope, in which any fraudulent manipulation is considered to be ruled out, provided that the evidence appears to us sufficiently good to merit scientific consideration. Reports submitted must be fully detailed, and the sitters must give some evidence that they possess that combination of photographic knowledge and acquaintance with the principles of deception which is absolutely necessary for such experiments.